With billions of dollars in revenue at stake, reeling in players is more important than inspiring them. Americans check their smartphones a collective 8 billion times a day, and increasingly, they’re pulling the phone from their pocket or purse to clock in a few minutes on one of thousands of addictive little games. More than 165 million Americans play mobile games, and they’re expected to shell out nearly $4.8 billion on gaming apps in 2017. But despite the growth of this lucrative market and the growing sophistication of the graphics and options offered by the games themselves, the ads that promote them are typically sophomoric. While ads for console video games have become cinematic spectacles with professional actors steeped in pathos, mobile game spots rely on standard tropes like CGI carnage and celebrity spokespeople. And it’s working. "In some ways, mobile gaming is still a few years behind video games in terms of marketing, but there is also a fundamental difference in what you are selling," said James Robinson, ECD at The Martin Agency New York. "Mobile games are designed to be played in short bursts on commutes or on boring phone calls when no one can see you, rather than in long stretches like a console game. So they are going more for instant gratification and casino-like in-game transactions, rather than emotional engagement." Mobile game ads don’t need to convince viewers to plunk down $400 for a console or $85 for a new game. Most mobile games are free to download and even play. Revenue comes from in-game micro-transactions, purchases for often less than a dollar that offer power-ups or in-game items or a bit more time on the clock. That revenue model requires drawing in as many eyeballs as possible, a goal that can push creative excellence to the side. "It's such a crowded market, the role of advertising might often be simply to keep a title top of mind, rather than reveal a big brand truth, or hint to a grander narrative," said John Patroulis, creative chairman of BBH New York. "Hence celebrities and big explosions." Nowhere has that played out more visibly than at the Super Bowl. In 2015, three mobile games ran advertisements during Super Bowl XLIX, getting their games in front of an audience of 114 million people. Much was made of the "Year of Mobile Games," which featured Kate Upton in a spot for "Game of War," Liam Neeson as his angry alter ego for "Clash of Clans" and a poorly animated CGI spot for "Heroes Charge." Arnold Schwarzenegger appeared the following year in a spot for "Mobile Strike." And in 2017, the Super Bowl included four ads for mobile games. Aside from "Angry Neeson," each of those ads fell at or near the bottom of USA Today’s AdMeter. In fact, the four 2017 ads occupied the last four slots on this year’s list. But according to the advertisers, they were effective in their own right. "Top Games is happy with the results because their core audience responded to it by downloading Evony, and that’s the real measure of success," said Crisitiano Alburitel, group account director at Butler, Shine, Stern & Partners, the agency that created a star-studded period piece for the popular mobile game for this year’s Super Bowl. "Historically mobile games haven’t ranked well in Super Bowl, but we’ve seen positive press outside Ad Meter. We played to our core, and we’ve seen positive results." Indeed, the app rocketed to 17th place on the US App Store download rankings on Super Bowl Sunday, which may indicate that mobile game advertisers know their audiences better than the critics. 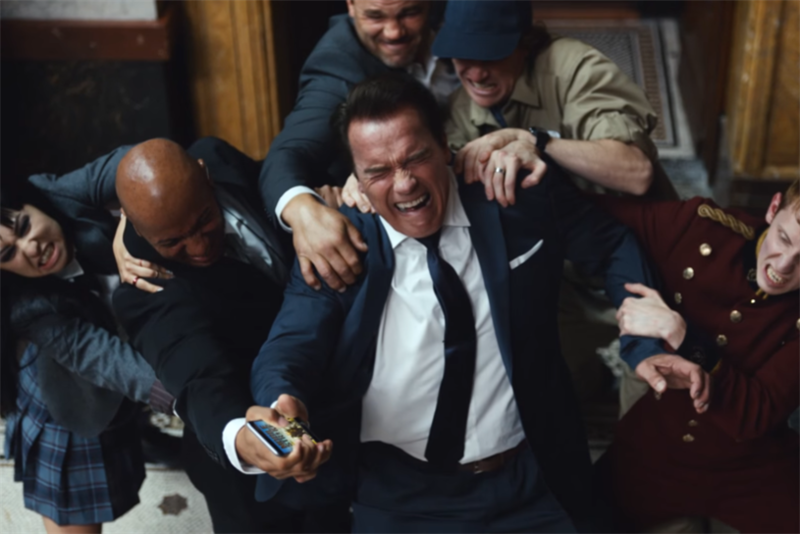 While Schwarzenegger’s 2016 "Mobile Strike" ad placed 57th out of 63 on the AdMeter, it ended the year as the most-watched commercial on YouTube, with more than 100 million views. It’s a numbers game, and each of those views is a potential player. According to some studies, 50 percent of mobile game revenue comes from fewer than one-fifth of one percent of gamers. The vast majority of people who play mobile games pay with nothing but their free time (and their attention span for in-game mobile ads, but that’s another story altogether). The true target for an ad for a mobile game is the elusive "whale," the rare gamer who is willing to pay $50 or $100 each month to keep playing the game at their own pace. They offset the moochers enough that annual revenue per user for the industry is a respectable $42.66. But it might be that the positive response marketers get from their current campaigns is what’s holding them back. "Run a commercial on a much-watched live event, and you can see in real-time whether your target downloads the game. So instant attention-getting tactics like explosions and scantily clad celebs can trump storytelling," Robinson said. "It is hard to convince a client to go another way when they have that data staring them in the face."